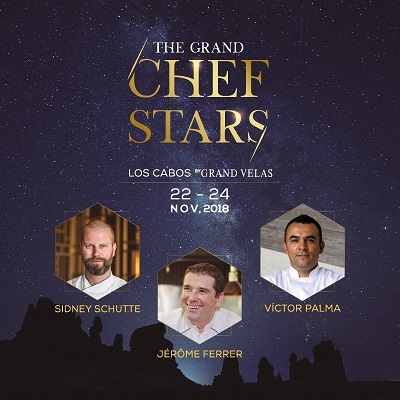 Hosted by Executive Chef Victor PalmaRelais & Châteaux Grand Chef Jérôme Ferrer and Two-Michelin-Star Chef Sidney Schutte of Grand Velas Los Cabos’ Cocina de Autor restaurant are joining forces for three evenings of extraordinary cuisine from November 22-24, 2018. Grand Chef Stars Los Cabos by Grand Velas returns for the second annual celebration of gastronomy. In addition to a collaborative nine-course dinner of contemporary cuisine with wine pairing, the event includes a Meet & Greet with the chefs. Highlights of the menu include Sea Scallop with Prickly Pear; Langoustine with Thai Strawberry Ceviche & Kobe beef with Marinated Maitake Mushrooms. The chefs will team up with Grand Velas Los Cabos Executive Chef Victor Palma who is adding local and seasonal ingredients to give a final touch of Mexican tradition. The Grand Chef Stars Los Cabos events are included for guests staying at the resort. Head of several famous culinary establishments in Quebec, Jérôme Ferrer is a French-born chef who arrived in Canada in 2001. His most famous restaurant, Europea, offers techno-emotional cuisine that provides patrons with a uniquely fresh culinary experience. Holding the exclusive Relais & Châteaux label, the restaurant has also been named among TripAdvisor’s Travelers’ Choice Top 10 restaurants in the world and “Restaurant of the Year” by Société des Chefs, Pâtissiers et Cuisiniers du Québec, the newspapers Le Devoir and Journal de Montréal, and the Debeur restaurant guide. Europea also holds a place in the GRANDES TABLES DU MONDE, a select association of 166 of the finest restaurants from 24 countries, spanning 5 continents. A Grand Chef Relais & Châteaux, Ferrer himself has been awarded the title of Chef of the Year by the Société des chefs du Québec. At the helm of Cocina de Autor restaurant at Grand Velas Los Cabos, Schutte gained extensive experience in prestigious kitchens throughout Europe and Asia, including Amber in Hong Kong, led by top Dutch chef Richard Ekkebus, recipient of two Michelin Stars; De Scholteshof in Belgium, under Roger Souvereyns, with two Michelin Stars; and De Librije in Zwolle, headed by the acclaimed Jonnie Boer, who with Schutte’s help obtained a third Michelin star for the restaurant. His Dutch heritage, passion for travel and four years in Asia shaped his palate and inspired him to present various taste sensations within a single dish. Ingredients themselves are a source of creative inspiration for him. Just seven months after second location of De Librije opened in Amsterdam under Schutte’s command, it was awarded two Michelin stars. He has been recognized as “SVH Meesterkok”, the highest recognition a chef can achieve in the Netherlands. With almost 20 years in some of the top kitchens in Mexico and abroad, Victor Palma is Executive Chef of Grand Velas Los Cabos. Prior to joining Grand Velas, he spent time within Rosewood properties in Mexico and the US, including six years as Executive Sous Chef at Las Ventanas al Paraiso in Los Cabos. Palma has trained with renowned Michelin-starred chef Joel Robuchon at MGM Grand in Las Vegas among other greats. Originally from Mexico City, he studied Culinary Arts at the Florida Culinary Institute of Boca Raton. The AAA Five Diamond Grand Velas Los Cabos on Mexico’s Baja Peninsula offers the next generation of all-inclusive amenities and facilities with dramatic ocean views and unique spaces infusing every area of the resort. Located between Cabo San Lucas and San Jose del Cabo, the beachfront property features 307 ocean view suites, all over 1,180 sq. ft. with private terraces and some personal plunge pools. Duplex wellness suites have designated fitness amenities, a personal Wellness Concierge and healthy food and beverages in suite. Grand Velas Los Cabos features five gourmet restaurants led by top chefs, including two star Michelin chef Sidney Schutte, complemented by an extensive beverage program and wine based features inspired by the proximity to Mexico’s fine wine region. A staff ratio of 3 to 1; 16,370 sq. ft. convention center with the capability for 20 breakout rooms; 35,000 sq. ft. Se Spa with 16 treatment rooms and hydrotherapy facility; three pools; and pool and beach concierges are available. Rounding out the list of amenities and services are a Technogym Fitness Center with personal trainers, exercise programs, yoga, Pilates and meditation; recreational activities program; separate teens’ and kids’ club facilities and activities program; 24-hour personal concierge service; baby concierge; and 24-hour in-suite service. Opening soon, a gallery of contemporary art will continue the company’s commitment to bringing the art, fashion and culture of Mexico to guests. The curved, half-moon design of the hotel catches eyes along the corridor with an iconic grand entrance that’s open air, three stories high and over 300 ft. above sea level. All of this beachfront, just 35 minutes from the Los Cabos International Airport which directly services over 40 destinations in the United States, Canada and Latin America. 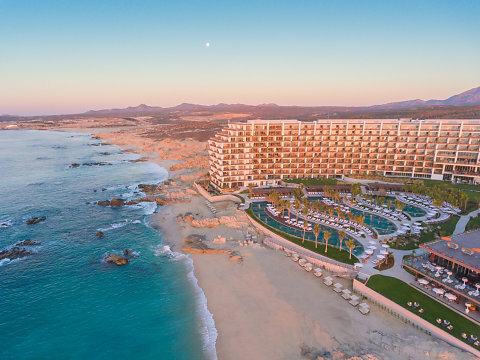 A member of the Virtuoso Hotels & Resorts Program, Grand Velas Los Cabos was built and is operated by Eduardo Vela Ruiz, founder and president of Velas Resorts, with brother Juan Vela, vice president of Velas Resorts, by his side. For reservations or additional information, call 1-888-407-4869 or visit https://loscabos.grandvelas.com/.